I finished up Chloe‘s cape today. It turned out pretty cute. I just kept adding ribbon until I was happy with it. It’s a pretty quick and easy project if you have the right materials on hand. I used wool suiting for hers. I tried it first in corduroy and it was too stiff. So so so cute! My daughter was over last night salivating over my Wee Wonderfuls book. Oh my she is absolutely precious. I love the ribbon you used to decorate her cape. So sweet. Could not love it more! Thank you so much for sharing! I am wondering if this cape would fit any of the dolls in the Wee Wonderful book? It’s always fun to have extra outfits for my girls to put on the dolls I make from it. I love Chloe’s hair! Women would kill for those sea-salt, beachy blonde waves….haha! So sweet! I have a random question about these girlies. My daughter has requested a rag doll for Christmas, but with very specific attributes. One of these is that she wants the arms to be able to go up and down (ie, not sewn pointing down like Olive and Archie). What kind of arm attatchments do these ladies have? 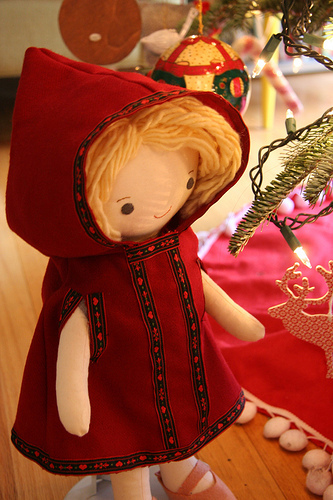 Her arms are sewn separately and then attached to the body — not sewn into the seam like Olive. It’d be easy to attach arms with buttons so they could move. Hurray!! Thanks so much for sharing this with us, I can’t wait to get started! 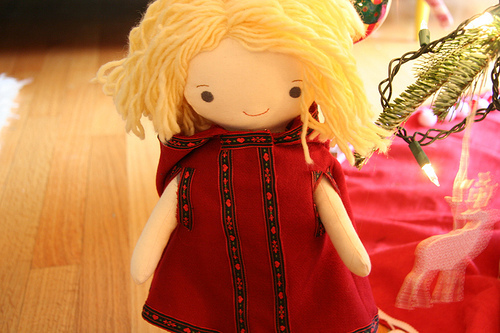 which dolls have you made? Oh, I love that dress! So chic- I want one for me! I’ve made a Patchwork Penny an Eddie and Edwina (For Edwina I used Eddies pattern but gave her Storybook’s ribbon Hair. My eldest likes to have a boy for all her girls.) Those are the ones I have made so far. cape would need to be sized up for Patchwork Penny but would fit Eddie fine. Thank you. It’s going to be a great addition to her Christmas present this year.